The Seagoing Cowboy follows a young man and his friend as they board a ship bound for Poland following World War II. One cares for horses, the other for heifers on the weeks-long journey. What they see when they arrive is sobering: the war had left the country in ruins, and many people had nothing left. The horses and heifers would go a long way in helping them rebuild their lives. Archival photographs, a map, and an author’s note supplement this fictional account of the real-life seagoing cowboys who took livestock to people suffering the effects of the war. 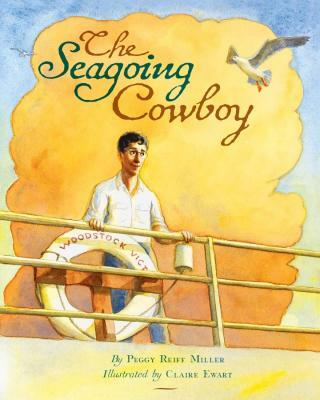 Peggy Reiff Miller is the author of the children's picture book THE SEAGOING COWBOY. She has been researching, writing, and speaking about the seagoing cowboys and the Heifer Project since 2002. Through interviews, questionnaires, diary accounts, photos, and movies of their trips, she has accumulated a wealth of information on these men who delivered livestock to Europe following World War II; much of it is documented on her website, seagoingcowboys.com. She serves as a historical consultant for Heifer International and, when not traveling, works from her home in Goshen, Indiana. Claire Ewart has illustrated such children's books as Tomie dePaola's The Legend of the Persian Carpet, Paul Fleischman's Time Train, Mahvash Shahegh's The Green Muscian, and Elsa Marston's The Olive Tree. She has also written and illustrated One Cold Night, The Giant, and Fossil. Ewart's work has been featured on PBS's Reading Rainbow and Storytime, shown in museums and galleries, and included in the Society of Illustrators' The Original Art exhibit. She lives in Fort Wayne, Indiana. "A fascinating and compassionate look at those who do good for the sake of others . . . a marvelous slice of historical fiction." -- Kendal Rautzhan, The Times Union.